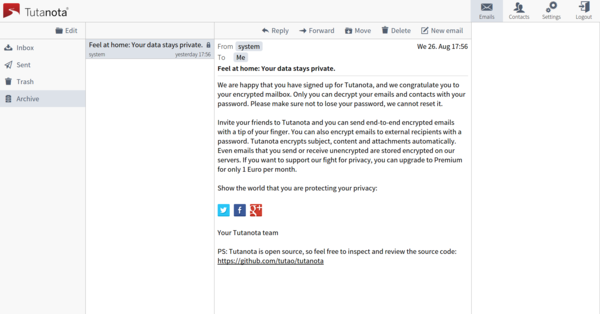 Despite its somewhat silly-sounding name, Tutanota is a serious open source email service and software that shows a lot of promise. In addition to keeping all your emails and contacts encrypted, Tutanota also provides a relatively easy way to exchange encrypted emails with your contacts. When you add a contact to your Tutanota address book, you have an option to specify a password you and your contact agreed upon. This password is then used to encrypt and decrypt correspondence between you and the contact. This approach greatly simplifies the end-to-end encryption system, although it does have a couple of drawbacks. Firstly, you need to agree on a password in advance and do it preferably through other channels than email. And this system works only if users on both ends use Tutanota. Even if encryption is not high on your list, you might appreciate Tutanota's simple and user-friendly web interface and the accompanying Android client app. The service is not overloaded with functionality, and some crucial features are still missing (most notably support for drafts, identities and filters). Still, the web interface is a pleasure to use and so is the Android app. The basic Tutanota plan is free, and it gives you a single email address and 1GB of storage. When creating an account you can choose between different domains, such as tuta.io, tutanota.de, and keemail.me. The Premium plan costs only €1.20/month (or €12/year), and allows you to add up to five email aliases and use Tutanota with your own domain. Soon you should be able to purchase additional storage space, too. Obviously, Tutanota is still at the very early stages of development, and there is still a lot to be done before the service can compete with Gmail FastMail and other established email providers. But if the current version of Tutanota is anything to go by, this project is off to a good start.